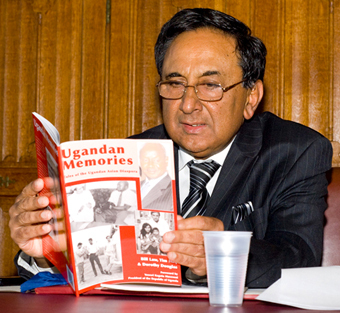 Our book Ugandan Memories was launched by the Lord Sheikh at the House of Lords on Monday July 13, 2009. Based on the Preserving Asian Heritage Project, the book is a study into the experiences of Asians expelled under the regime of dictator Idi Amin. It is a 62-page illustrated book by Bill Law, Tim Haq and Dorothy Douglas from the East Midlands Economic Network and is produced in conjunction with the University of Leicester. President of Uganda Yoweri Museveni gives a foreword for the book which provides a platform for those who were dispossessed by Africanisation policies to articulate their experiences. "What emerges is intensely personal and at the same time universal as we witness, through the words of those who lived the experience, what is the pain of being uprooted and the suffering of migration," said Tim Haq. "Amin's act of expulsion - first the Jews and then the Asians - left a lasting legacy around the world, and particularly so in Leicester where many Uganda Asians sought to rebuild their lives. It is their stories that speak through Ugandan Memories." Colin Hyde, from the East Midlands Oral History Archive, based at the University of Leicester, added: "Ugandan Memories is a useful resource for anyone interested in the history of Leicester, of East Africa or of migration to the UK. It provides valuable information about family and community history and sheds light on a remarkable period of history." Our pictures show from top: A panoramic view of the launch of Ugandan Memories hosted by the Lord Sheikh at the House of Lords. Lord Sheikh reads passages from the book that rekindled his memories of living in Uganda. 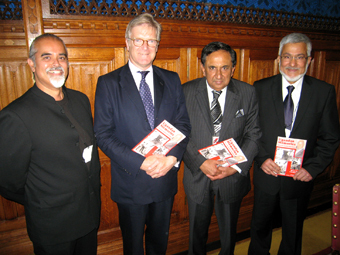 Tim Haq, EMEN chair and co-author of Ugandan Memories with Edward Garnier QC MP, Lord Sheikh and Jaffer Kapasi OBE.